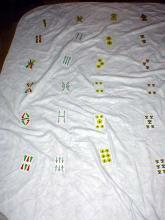 i attach pictures of my particular homemade twister carpet, is made of Spanish cards, 1st column from the left (green) 2nd blue, 3rd yellow and 4th red . No pantyhose on your arms? (08 Oct 2011, 00:14 )Like Ra Wrote: No pantyhose on your arms? But still, what's the point? Just crouch on all fours for a couple of minutes? (08 Oct 2011, 00:55 )Like Ra Wrote: But still, what's the point? Just crouch on all fours for a couple of minutes? 00:53:05 ‹Morten A› can you feel the dots on the carpet ? 00:54:19 ‹Morten A› what hood do you have ? 01:01:16 ‹Like Ra› Is twister a fetish?